Lipstick Palm trees (Cyrtostachys renda) are native to Malaysia, and are known for their unique red trunks as well as their feather-like fronds. These palm trees are popular in commercial and residential settings.They add tropical flair when planted as an accent or focal point in the landscape. Cyrtostachys renda (also known as Lipstick Palm and Sealing Wax Palm) belongs to the Arecaceae family, and can be planted year round in USDA hardiness zones 11 through 12. The Lipstick Palm tree is not considered to be cold-hardy or drought tolerant - it prefers temperatures ranging from 75 to 85° F and should be kept evenly moist. 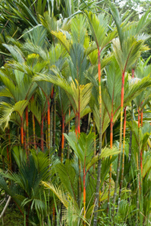 Lipstick Palms can grow up to fifteen to twenty feet tall, palm fronds can grow up to two feet long. Feather-like fronds grow upward and outward from multiple red, bamboo-like trunks. Sealing Wax Palm tree trunks can vary in color from yellow to orange to red. The feather-like fronds are dark green in color, with a leaf blade of eighteen inches. These palm trees are typically planted outdoors in the ground or in large containers. Lipstick Palm trees add elegant tropical appeal to residential and commercial landscape designs. These palms are typically used as focal points or accents in the landscape. USDA Hardiness Zone– Can be planted year-round in zones 11 – 12. Location – Choose a location that receives full to partial sunlight. The location should be large enough to accommodate full growth (up to twenty feet tall). Allow a minimum of fifteen between plantings. Lipstick Palm trees prefer high humidity and lots of water. Soil – Sealing Wax Palms like sandy, well-draining soil. Dig a hole twice as wide as the root ball. Note: The hole should be as deep as the root ball is tall. The soil surrounding the roots should be loose to allow for easy establishment. When placing the root ball in the hole, make sure the tree is standing straight. Fill the hole halfway with soil and pack firmly. Fill the hole with the remaining soil while packing firmly around the base of the palm tree. Apply three to four inches of mulch around the base of the tree. This will help to keep the soil moist as well as reduce weed growth. Water thoroughly after planting is completed. Newly planted palms like lots of water. For the first two to three weeks, water daily. Continue watering three times a week. Once established, keep soil evenly moist. Approximately six weeks after planting, fertilize Lipstick Palms with a high-quality palm tree fertilizer. Fertilization schedule will be three times a year thereafter. Note: Choose the location wisely; transplanting palm trees once they are established is risky.